Year : 1930. Item : oversized cover. Country : Japan. Rest of the World - GBP 6,00. Rest of the World - GBP 4,50. We have been in the collectible bussiness for over 80 years! If you are looking for anything, any topical or country, let us know, we will make sure to let you know what else we have! Country : Japan. Item : Oversized Cover. Year : 1955. Item : Maximum Card. If you are looking for anything, any topical or country, let us know, we will make sure to let you know what else we have! Year : 1958. Item : oversized cover. Country : Japan. Rest of the World - GBP 6,00. Rest of the World - GBP 4,50. We have been in the collectible bussiness for over 80 years! Country : Japan. Item : Maximum card. Rest of the World - GBP 5,00. Rest of the World - GBP 3,00. We have been in the collectible bussiness for over 80 years! If you are looking for anything, any topical or country, let us know, we will make sure to let you know what else we have! Country : Japan. H & G Cat. PAESE - Giappone. CONDIZIONI - MNH Nuovi con gomma originale integra. Isole RYUKYU Giappone TROPICAL FISH 3c 1966 problema pesce pagliaccio non sealed FDC. Quality Used. Topic FISH. Condizione: F-VF. Isole RYUKYU Giappone TROPICAL FISH 3C FORCIPIGER LONGIROSTRIS problema 1967 FDC non sealed con inserto. Type Cover. Quality Used. Topic FISH. Condizione: F-VF. Isole RYUKYU Giappone TROPICAL FISH 3C SADDLEBACK pesci farfalla problema 1967 FDC non sealed con inserto. Type Cover. Quality Used. Topic FISH. Condizione: F-VF. DELLA PESCA PRODOTTO AYU PESCE 10 RILASCIO 1966 NCC CACHET SU FDC NON SEALED CON INSERIRE. Topic FISH. Condizione: F-VF. PESCE E SEASHELL SERIE SAZAE SEASHELL PROBLEMA 1967 BSB CACHET SU FDC NON SEALED CON INSERIRE. Topic SEASHELL. Quality Used. Condizione: F-VF. PESCE E SEASHELL SERIE CODA GIALLA PROBLEMA 1967 BSB CACHET SU FDC NON SEALED CON INSERTO. Quality Used. Topic FISH. Condizione: F-VF. (2x Sheetlets with 10 self-adhesive values each (2x 10v S/A M/S): 62 x 10, 82 x 10. 3) Select each item and 'Add to Basket'. Japan 2017 World of Children's Picture Book Series No. 1 - Mint Never Hinged (MNH). Sheetlet with 10 values (10v S/A M/S):82 x 10. You will be back for more! STAMP FEATURES FLORA & FAUNA - CORMORANT FISHING. 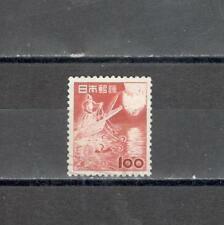 USED CONDITION STAMP - 100 yen IN VALUE, FIRST ISSUED 15/9/1953. MLH - Mint Lightly Hinged – Good clean stamp with little or no hinge remainders. 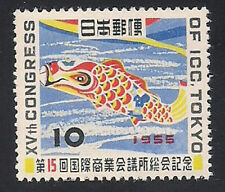 1965 Fish 2 x Blocks of Four. MNH - Mint Never Hinged. The SG number is given for a guide only. IF I HAVE MADE A MISTAKE OR. (Japan 2017 Diplomatic Relations Japan-Maldives - 50th Anniversary - Mint Never Hinged (MNH). Sheetlet with 10 values (10v M/S): 82 x 10. 3) Select each item and 'Add to Basket'. 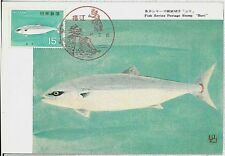 A 1966 Japanese Maximum Card displaying a stamp depicting the Masaba Mackerel Fish. Emartenetjapan emartenethong kong emartenetchina emartenets.e. asia emartenetindonesia. Signed For - £1.75 (up to 100 gms) or £4 (over 100 gms). Signed For - £1.75 (up to 100 gms) or £4 (over 100 gms). CONDITIONS OF SALE.